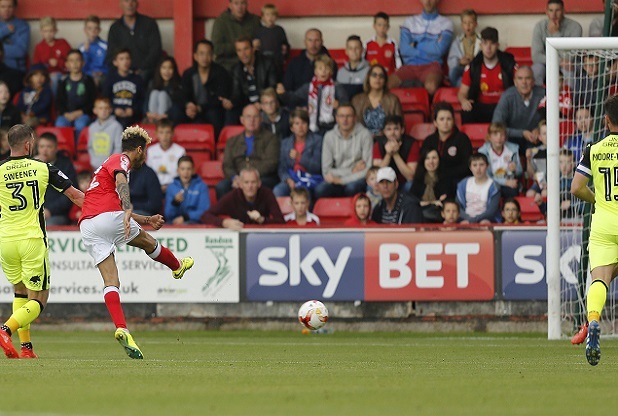 Exeter City fell to their second away defeat of the League Two season as they were beaten 2-0 away at Crewe Alexandra. Goals from Alex Kiwomya and Danny Hollands won the match for the Alex despite the Grecians enjoying plenty of possession and chances at Gresty Road. City manager Paul Tisdale made two changes from the team that beat Colchester United 3-2 last time out, with Luke Croll missing the game through illness and Ethan Ampadu dropping to the bench. That meant Connor Riley-Lowe came in at left back and Joel Grant started up front. City began the brighter of the two teams, with Robbie Simpson testing home keeper Ben Garratt with a 20-yard shot and, in truth, the Grecians had the majority of the first half chances with Ryan Harley blasting into the side netting and Jake Taylor volleying wide. However, it was a defensive lapse in concentration that cost City the opening goal after 22 minutes as Kiwomya sprung the offside trap. George Cooper played a ball over the top of the defence and the Chelsea loanee raced onto the pass before rifling a half volley past Bobby Olejnik. City had the greater possession and territory in the first half as well, but could have been 2-0 down when some hesitant defending saw Chris Dagnall pick up the ball on the edge of the area and round a stranded Olejnik. However, with the goal at his mercy, the former Hibernian striker side footed a shot wide. That was a let-off for the Grecians and they almost made Crewe pay for their miss as a cross field pass found Watkins in space. However, after working a yard of room, the City striker sent a right foot shot whistling past the upright before Lloyd James fired another over, from a free-kick, just before the break. Crewe had the first meaningful chance of the second half as George Cooper’s low cross was expertly put behind for a corner by Pierce Sweeney with Dagnall lurking. However, City began to create chances again after the 50-minute mark with Jack Stacey clipping a shot onto the crossbar, Jake Taylor firing narrowly wide and Ryan Harley testing Garratt with a shot from the edge of the area. The Grecians even had good shout for a penalty turned down when Harry Davis appeared to handle a Taylor shot. That forced Crewe boss Steve Davis into a double substitution with Harry Davis and captain Ryan Lowe departing for Callum Ainley and George Ray. The chances kept coming City’s way though as Watkins fed a ball to Riley-Lowe in the box, but his close-range shot was blocked. Crewe hit back with Dagnall springing the offside trap once more to rattle the outside of the post, but then Simpson fired off target at the other end having been found by Grant, unmarked in the area. City were grateful to Olejnik with 15 minutes left to play as he turned John Guthrie’s header over with a great one-handed stop. It was that point, Tis turned to his bench bringing on Matt Oakley for Joel Grant. Taylor then had a great chance to equalise as he was played in by Sweeney, but he was halted by a somewhat questionable offside flag. However, Crewe sealed the victory three minutes from time as City lost the ball in the centre of the park and Danny Hollands picked up a bouncing ball on the edge of the box before firing a shot under Olejnik and into the back of the net. Crewe Alexandra (4-4-2): Garrat; Turton, Guthrie, Davis (Ray, 60), Bakayogo; Cooper (Kirk, 86), Jones, Hollands, Kiwomya; Lowe (Ainley, 60), Dagnall. Subs not used: Richards, Nugent, Saunders, Bingham. 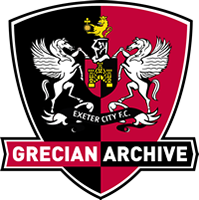 Exeter City (4-3-3): Olejnik; Stacey, Sweeney, Moore-Taylor, Riley-Lowe; Harley, James, Taylor; Watkins, Simpson, Grant (Oakley, 75). Subs not used: McAlinden, Jay, Butterfield, Byrne, Pym, Ampadu.